New Parts are just as important as new knives! 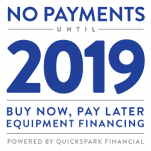 Pro Processor offers #12 Motor!! Will fit American Eagle #12 and Hobart #12 and compatibles with 9/16" square drive and tapered stud that is 1 3/8" in diameter tapering up to 1 7/16" at body of head. 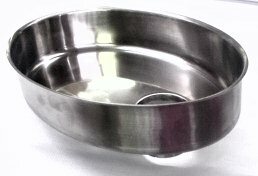 Includes stainless steel pan. Will fit Hobart #12 and compatibles and compatibles with 9/16" square drive and tapered stud that is 1 3/8" in diameter tapering up to 1 7/16" at body of head. 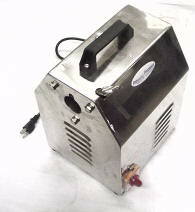 Compatible with American Eagle #12 and Hobart #12 and compatibles with 9/16" square drive. 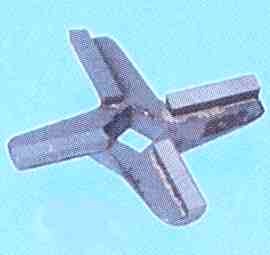 May also fit American Eagle AE-G12N & Chinese TC-12. Use for #10/12 manual or electric grinders. Used on commercial grinders. German made. 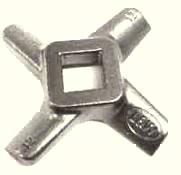 Square hole measures 12 mm or 15/32. 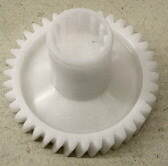 It has 3mm holes and is used for a fine grind. . This grinder has 4mm. holes and is used for a hamburger grind. 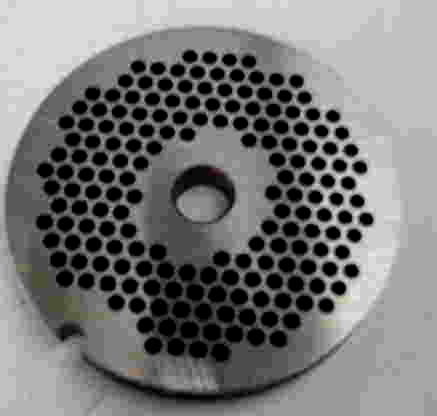 Stainless Steel grinder plate for #10/#12 manual or electric grinders. 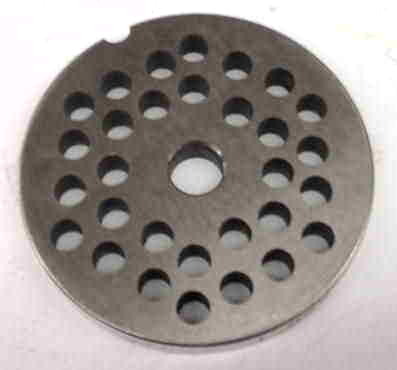 This grinder plate has 6mm. holes and is used for a sausage grind. 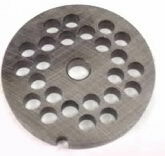 Hardened Carbon Steel Grinder Plate for #10/12 manual or electric meat grinders. This grinder has 8mm. and is used for a coarse sausage grind. This grinder has 10mm. holes and is used for a chili grind. 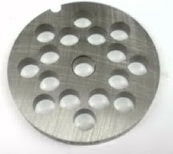 Grinder Plate is reversible and has one flat edge. 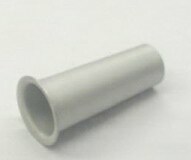 Measures: 2 3/4" diameter hole size 3/16". 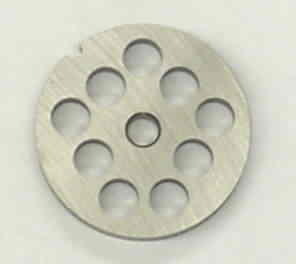 Measures: 2 3/4" diameter hole size 1/4". 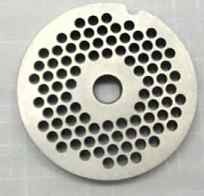 Measures: 2 3/4" diameter hole size 3/8". 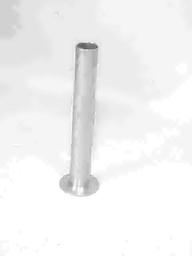 Is used for stuffing regular sized sausage, 30mm and larger. Cast pulley for #10 - #12 meat grinder. Use only with meat pusher. Holds extra meat in preparation for grinding. Really makes life easier with motorized grinders. Measures 8 3/4" W x 13" L x 2 3/8" D.
Will fit Tre Spade and EARLIER Weston and Cabela's grinders. Compare teeth for an accurate fit! Should fit many Italian #12 and #22 grinders. Will fit Tre Spade and EARLIER Weston and Cabela's grinder BUT compare teeth. 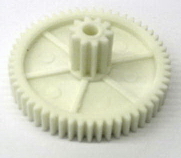 Used also with Gear #699553. Will fit Tre Spade EL-12 and EL-22. Compare teeth. 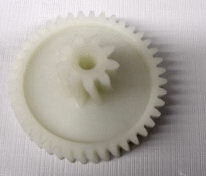 Outside of Gear has 38 teeth and inside has 12 teeth. Compare teeth. 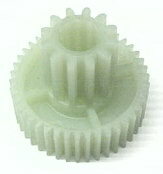 Outside of Gear has 55 teeth and inside has 10 teeth. Has 60 teeth on the outside ring and 12 teeth on the inside ring. Should fit MOST #12 and #22 grinders. 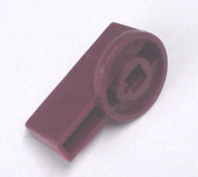 Grinder Bushing --fits #10 -#12 Choprite and others. 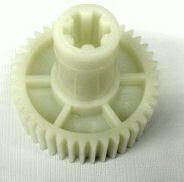 Provides thrust and a bearing surface so that the knife and plate can be forced together. Will fit the Electric LEM Meat Grinder. Inside hole measures .87" and is 1.37" in diameter.